The STAR line workstations are based on superior air displacement pipetting technology. This increases accuracy and repeatability while providing chain of custody with pipette condition monitoring and recording. Each workstation can be configured with multiple arms and each arm can be configured with multiple pipetting and labware gripping devices. Pipetting channels and labware grippers move independently of each other, supporting the use of a wide range of labware. The autoload option provides barcode tracking of samples, labware, racks and carriers. All workstation functions and integrated third-party devices are controlled by the Venus software. Venus One is the newest software package for the STAR Line. It offers the most intuitive, flexible and powerful programming control. Venus offers all the tools to allow simple to complex programming, without limiting your imagination or compromising your requirements. Data can be tracked and processed within the application as well as interfaces to internal and external databases, including LIMS. 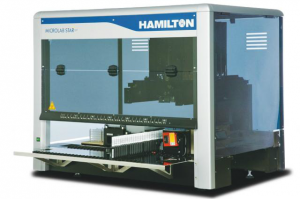 The STAR can serve as a simple pipettor for serial dilutions or act as the center of a large system with multiple workstations and third party devices such incubators, cell counters, centrifuges, etc.